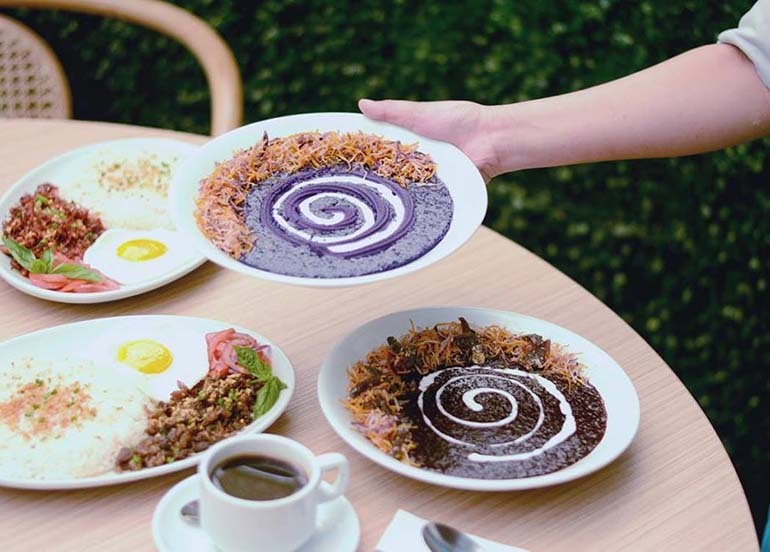 There are things that are perfect in pairs such as bread and butter, cheese and crackers, and sometimes we get surprised at how some things can actually go so well like salt and caramel and… UBE AND LECHE FLAN. 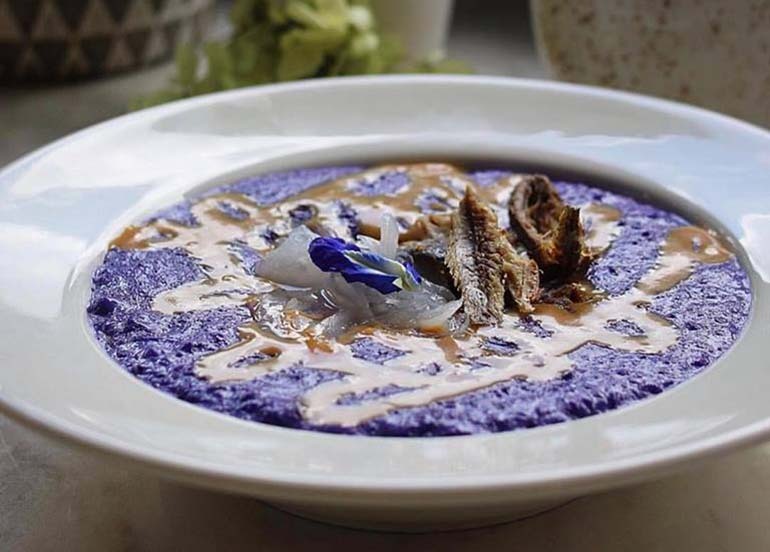 The root vegetable with the vibrant Prince shade of purple known to Filipinos everywhere as ube or purple yam is commonly found in desserts so it makes perfect sense to pair ube with our other favourite dessert, leche flan! 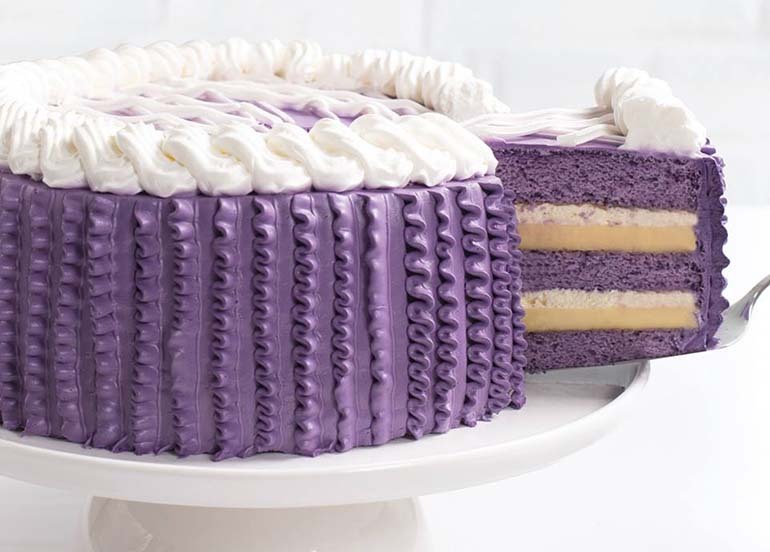 We bring good and super yummy news… Conti’s is bringing back their Ube Custard Cake! 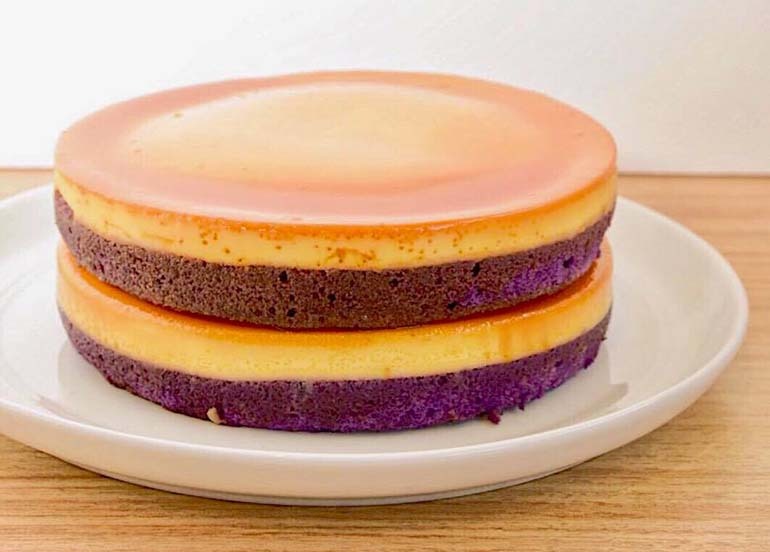 We’ll finally be able to sink our teeth in the rich and creamy leche flan alongside the earthy and slightly sweet ube. 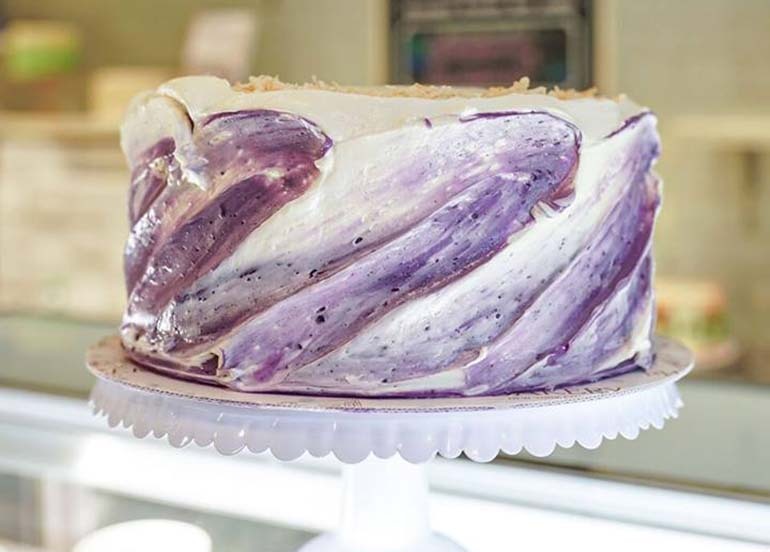 You can grab this purple yam cake filled with creamy custard, ube sponge cake, and purple frosting at Conti’s branches but only for a limited time so hurry! 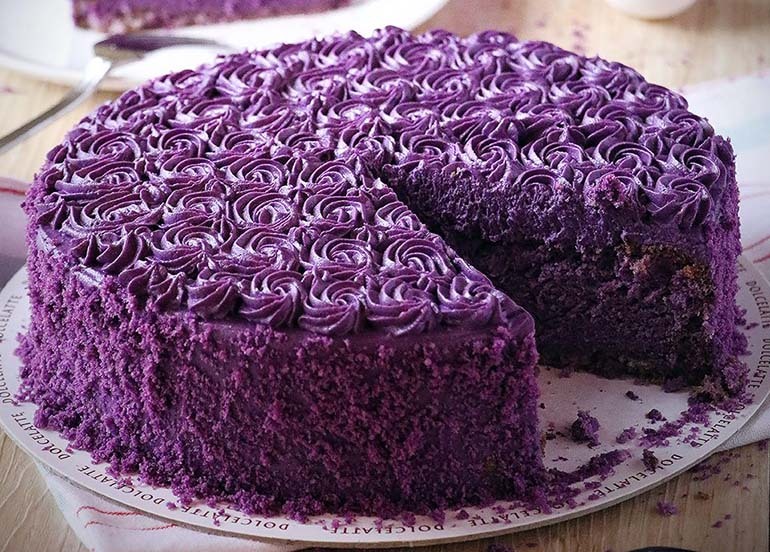 Scroll down for more Ube goodness! 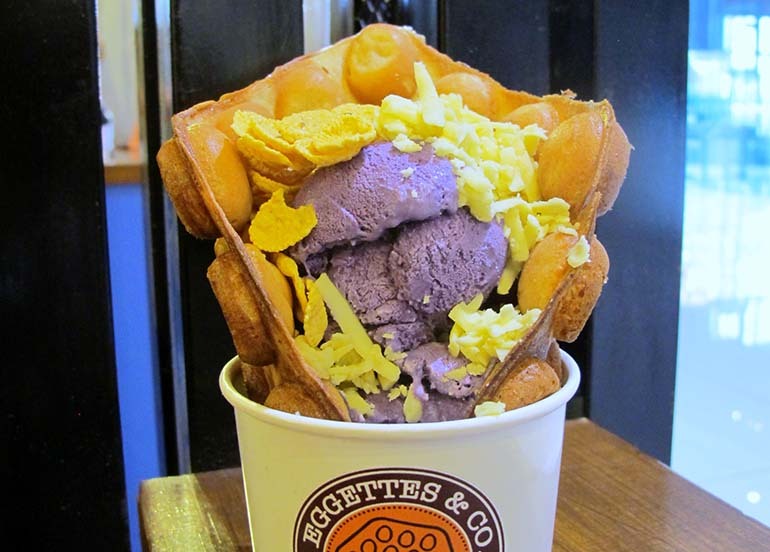 Cheesy Ube – Eggettes & Co.
Eggettes and Co. is a dessert stall serving Hong Kong’s famous street snack with a twist. Pick from their signature eggette sundaes or create your own! Bellefleur is a homegrown bakery that began from the owner’s love of baking. 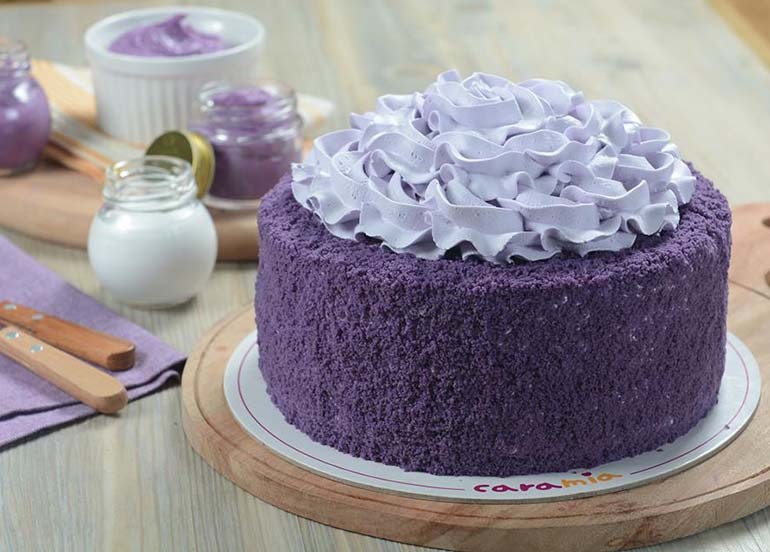 They’re popularly known for their Ube Leche Flan apart from their other delectable creations. 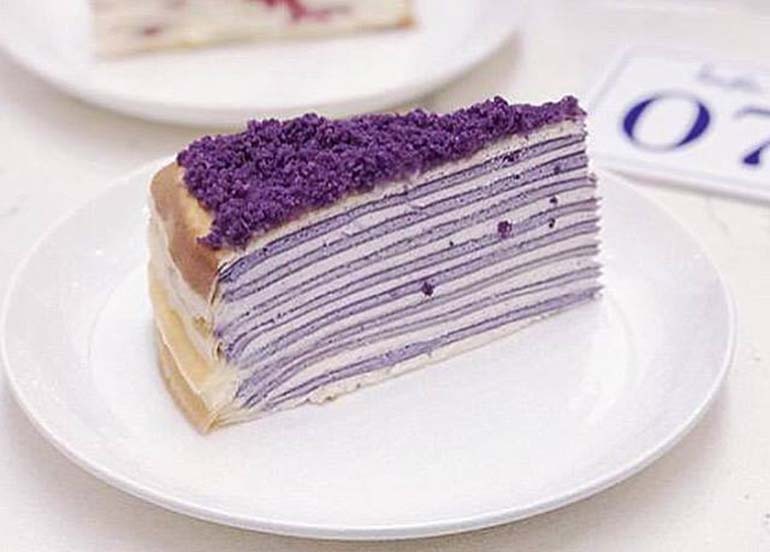 Insider tip: They also offer Frozen Ube Brazo! The Rabbit Hole is a unique, quirky rest stop where you’re “fur-ry” to be yourself. On the path of culinary discovery, it’s their job to make sure that among good friends and great food, your hopes and dreams make leaps and bounds, as your inspirations soar higher. Sear Steak Scullery is a Western-themed restaurant with Asian influences that offers a full service semi-fine dining experience. 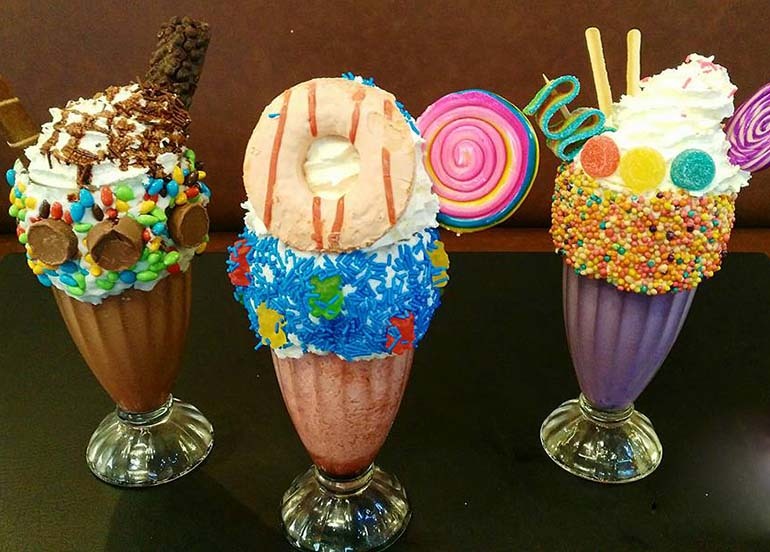 Menu highlights include stone grilled steaks, seafood dishes and crazy milkshakes. Hukad is a Cebu-hailed restaurant focusing in regional Filipino fare including Cebu Lechon. It traces its roots since 1982 and has a restaurant coverage of more than 25 branches in Visayas and Mindanao. 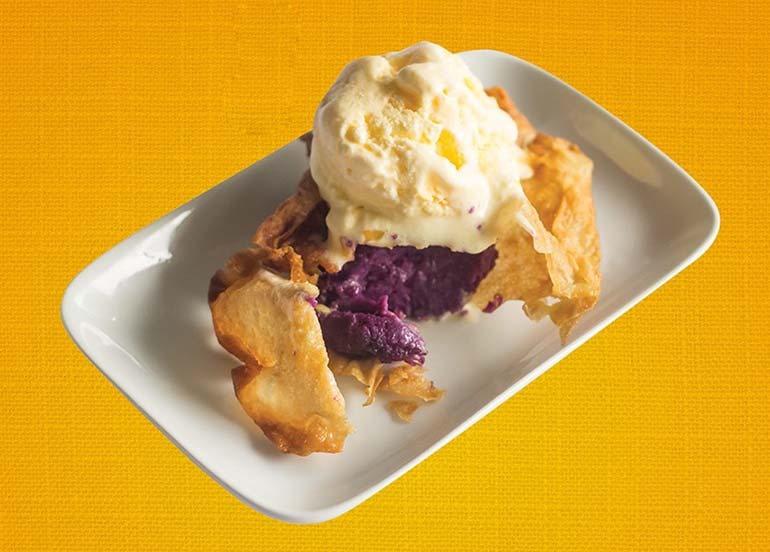 One of their signature desserts include the Ube Halaya Crisp ala mode, which is made of light and crispy fried rice paper pouch, filled with sweet and thick ube jam, and topped with mango ice cream. Kabila Filipino Bistro can be found alongside the Museum Cafe in the Ayala Museum. The restaurant offers regional Filipino dishes with a modern take. Dolcelatte is a gourmet restaurant and bakeshop that was put on the map with their sought-after croughnuts. 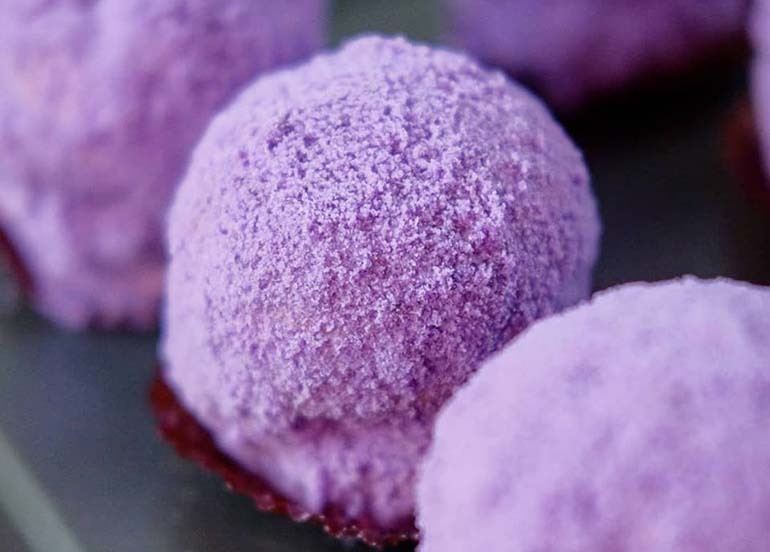 Now, they’re also a go-to for gourmet dishes and specialty desserts. Insider tip: They also have Ube Cake Shake and Ube Croughnuts! Manam is best known for its two-part menu consisting of traditional and modern dishes with a twist on Filipino favourites. Insider tip: They also serve Ube Sago! Tsujiri is a Japanese matcha brand from Uji Kyoto that specializes in authentic, premium green tea drinks and are the pioneer in matcha infused desserts – from ice cream to cakes and pastries. 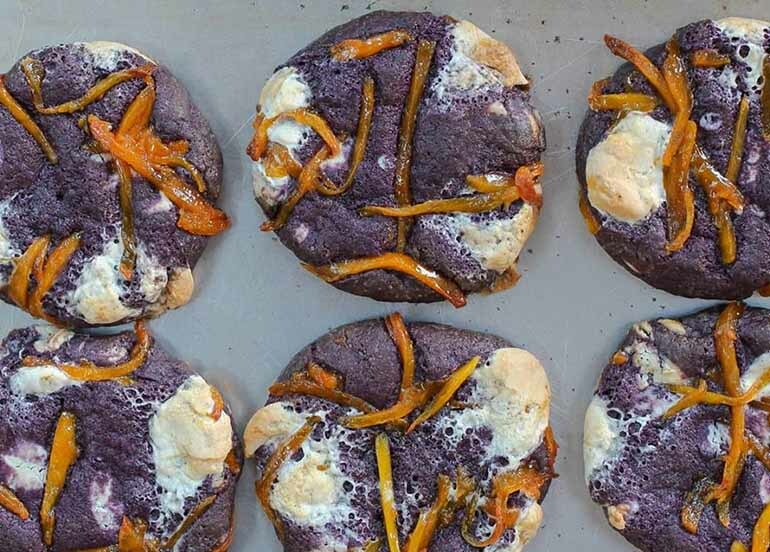 It’s one of the most go-to stalls at Hole in the Wall, the cookie shop has admittedly taken the ube game seriously and has come up with a Gooey Ube and Ube Craft Milk. A well known bakery from New York, M Bakery is finally in the Philippines. They’re most known for their banana pudding but also have a wide variety of desserts. At the moment, it’s only in their Philippine branch that they offer their ube selections. 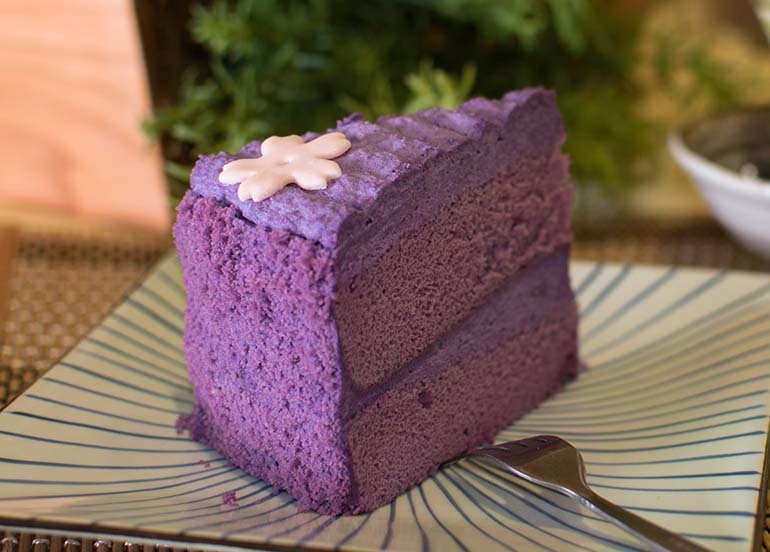 Insider tip: They also have a cupcake version of their Ube Cake! Brownies Unlimited has been serving notoriously chewy, decadent brownies since 1988, only selling four classic flavours such as Walnut Swirl and Rocky Road. Their selection of brownies expanded over the years, now serving more flavours and bigger brownies! 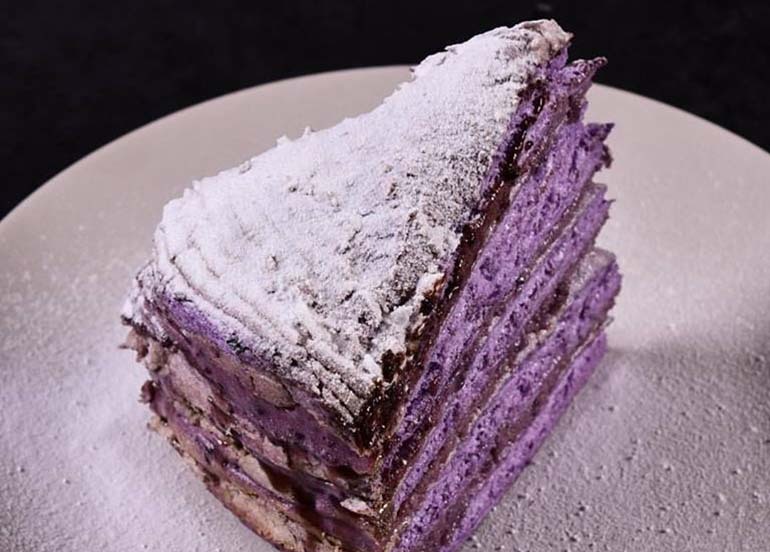 Paper Moon Café specialises in French desserts made with meticulous Japanese skill and is best known for their crepe cakes. They’re a brand from Tokyo and have since adapted to the Filipino palette with flavours like their Paper Moon Café. Flossom Kitchen + Café is photogenic café with their first branch in San Juan. They serve comfort food amidst their nature inspired restaurant. 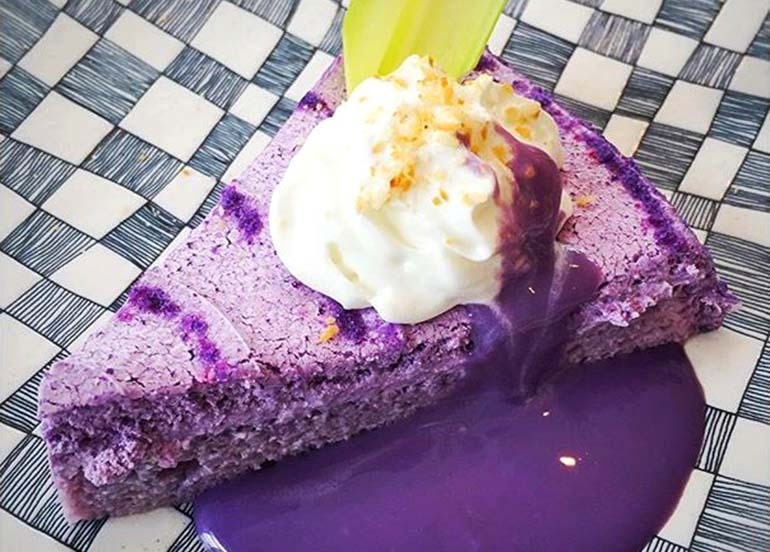 Did we miss your favorite UBE dish and desserts from your favorite restaurants? Share it with us in the comments section below. Don’t forget to tag us @bookyapp on Instagram so we can join all your food-ventures! Wanna get a head start on food, fitness, and beauty this 2019? Download the Booky app and enjoy even more amazing offers and discounts from your favorite spots all over the Metro!